If films are to be reviewed as per the huge effort made, the loads of never-before graphics and their gigantic budget then all such biggies can easily be given good ratings ignoring everything else including the project’s entertainment quotient. But that isn’t how it should be done, which was exactly the case with THUGS OF HINDOSTAN a few weeks back. And which is more or less also the case with 2.0, though not in the same measure or with the same amount of extreme negativity. To begin with, if you are simply interested in watching some partially tacky yet never before kind of VFX in an Indian film featuring two renowned stalwarts of their respective regions, then 2.0 surely deserves to be seen, even when the graphics are not at par with what we get to see in the western cinema. The huge effort has surely been made, but it has also been overdone, at the cost of compromising with the script as well as the entertainment, missing the logical detailing not provided by the writing team. In clear words, 2.0 doesn’t have any engaging mystery at all and also lacks the projected horror element dealing with a dead man’s spirit and his strange, supposedly scary appearance. Plus, if you are expecting some great entertaining sequences coming one after another in its story progression or some highly engaging and electrifying dialogues/clashes between the two titans on the screen, then it actually has got quite less of that giving you the exact picture. Heavily focusing and relying on the VFX department, its first half keeps on repeating the same innovative visuals (mobiles vanishing into the air) and the routine vengeance killing strongly reminds you of Shankar’s own ‘I’. But the biggest drawback of this initial hour remains the too late coming of Chitti and Akshay Kumar after a prolonged, annoying wait. Hence till interval, you only get to praise the meaningful premise of the film sadly presented in a less entertaining, technical manner. Thankfully, the narration does find its much required connect with the viewers with an emotional flashback post the intermission. But here too the emotions are not as strong and effective as seen in writer-director's earlier films. 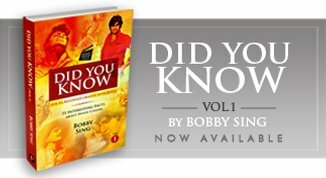 And that’s also because for a major part of the film, Shankar remains highly engaged in only the technical presentation of things, in the science and explanations, which though are fascinating but do hamper the entertainment element at various intervals. 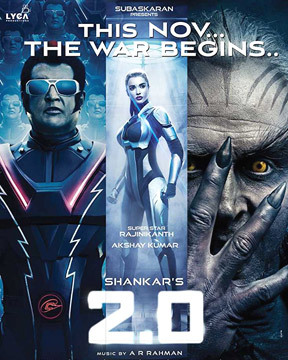 Apart from the usual, an all familiar plot of a wronged individual going for his revenge from the officials responsible for disturbing his peaceful life, 2.0 also has a weirdly underdeveloped sub-plot of a jealous colleague (Sudhanshu Pandey) and lack of humour too which rightly makes a surprise entry in the praiseworthy climax. A song-less film (with a song inserted in the end credits), one even doesn’t find anything extra-ordinary or inventive tried in its background score by A. R. Rehman, whereas cinematography, editing and sound designing does grab your attention, particularly in the sequences dealing with the birds and the grand climax. In fact, the final 20 minutes can easily be called the major highlight of the film bringing back the action, excitement and even humour offering you the return of money spent. However the logic of public safety (the people present in the stadium) still goes for a toss in the grand visual effects incorporated in its finale sequences. Almost entirely revolving around just Rajinikanth and Akshay Kumar, the veterans do perform well in the their given roles but eventually its Akshay Kumar who deserves to be praised for accepting such a risky role and enacting it with great confidence too. Amy Jackson doesn’t get much to do playing the beautiful robot and the rest of cast gives you nothing great to mention in specific. In all, the message of mobile phone radiations affecting the life of birds as well as the humans remains the best part of the film as I strongly felt. Otherwise, apart from the grandeur, 2.0 doesn’t turn out to be as entertaining as expected wasting an unusual, rare casting. Moreover, may be it was the faulty projection in the multiplex, but I did have a terrible time watching the film’s 3D version (probably the first Indian film to be actually shot in 3D). So you can surely watch it if the grand effort made and the VFX are the only features you are interested in ignoring the story telling, script and other expectations from the biggie in terms of entertainment. Note : Following the same old exploitive practice, the ticket prices were yet again raised by the multiplexes for the film releasing on even a non-festive day or weekend. Now though the people might have accepted this timely exploitation without thinking of any revolt as such, BTC will continue the tradition of deducting a big one star from such films increasing their ticket prices, not caring about the interests of their passionate viewers. Three years ago, director Shankar and Lyca Productions announced that they will be churning out a sequel to the blockbuster hit film Robo. Later, the film was titled as 2.0 and was creating enough buzz during the filming. 2.0, as we all know, stars Rajinikanth, Akshay Kumar and Amy Jackson in the lead roles. So far, SS Rajamouli’s Baahubali 1 and 2 were regarded as India’s most expensive film. Little did the world know that 2.0 will dethrone Baahubali series and become India’s costliest film. Do keep visiting and sharing your comments too. superb writeup. fully agree with your point of view. one question, do you see a 3.0 ? as dropped a hint in the end. With apologies for the late reply, thanks a lot for your support. And yes there certainly seems to be a 3.0 coming (made in a controlled budget) as these sequels give them a readymade marketing ground in terms of selling the film.